If surrealism was a revolutionary movement representative of the liberation of a previously dormant collective imagination, A Field Guide to Surreal Botany , edited by Jason Erik Lundberg and Janet Chui (who also contributed striking illustrations), a lovely little book encompassing a vast collaborative collage of imagined plant specimens, is a quiet inversion, a patient investigation of the fantastic in literature. Too much attention to the actual tenets of surrealism as a framework for understanding A Field Guide to Surreal Botany would probably do the book a disservice, as, due to its necessary subscription to formula, it doesn't necessarily align itself with the more disorganized, chaotically free expression of "the real functioning of thought" (as Andre Breton defined the movement in his seminal Surrealist Manifesto ). Surreal , in this instance, is a stand-in for unreal , a signifier of the presence of the fantastic, and the book, counting among its contributors a number of writers closely associated with the community of speculative fiction, succeeds as an investigation of the idea of fantasy and its purpose, generally, within the literary community at large. The book contains 48 entries, each written by a different author and describing a different variety of surreal plant, a project similar to that of Jeff VanderMeer and Mark Roberts's The Thackery T. Lambshead Pocket Guide to Eccentric & Discredited Diseases , which chronicles a history of medicine playfully constructed by an impressive list of best-selling and award-winning writers. The entries in A Field Guide to Surreal Botany are perhaps not meant to be read all at once, or even in sequence, as the uniformity of presentation and often relatively minor deviations in content (for example, the dimensions of the plants themselves and the size and color of their leaves and flowers begin to feel redundant as you venture further through the slim volume) undercut the inherent beauty and import of the project itself. Reading the book cover to cover, as I did, invites the impression that the individual entries are perhaps inherently slight and the project itself too whimsical. As a whole, however, the endeavor assumes a general responsibility greater than the sum of its parts: that of the creation—through the accumulation of painstaking physical descriptions, elaborately contrived anecdotes, and clever origin stories—of a new world that strives to simultaneously infiltrate and fantastically reimagine the one in which we currently reside. Many of the entries are worth noting for their success as self-contained glimpses into an imagined world. While a number of contributions simply add clever details to plants that we would otherwise clearly recognize (the ability to generate hummingbirds or small cats being unique details in otherwise banal specimens), some reach further to express unique interpretations of the theme far removed from any preconceived notions of how plants look or, in some cases, behave. There are plants that may or may not contain the souls of the dead, plants that originate in dreams, and plants that thrive in the suburbs and maliciously attract prepubescent girls to serve as makeshift wombs. Another suburban plant variety, Leonidas' Bloom ("discovered" by Adam Nakama), causes anyone who inhales its pollen to "exhibit exceedingly strange behavior, treating every trivial dispute as if it were a dramatic last stand" (p. 61). There are plants that are only visible in the dark, plants that fly, plants that ignore the laws of space and time, even plants that, when occupying an infected host, can elevate them "to the status of celebrity, revolutionary leader, or even—if historical speculation is to be considered—God" (p. 53). It's worth mentioning several other entries in an effort to provide a representative sample. Vera Nazarian's Twilight Luon-Sibir, while only existing for a few minutes, undergoes the experience of corporealis , "the delicate process of temporary fixation in a physical plane," and is rumored to drive us "to move, to act, to communicate ... Allow Twilight Luon-Sibir to inspire you and you might change the world" (p. 32). The Esemtep, offered by Steve Berman, is a plant that grows entirely within a computer and is visible only on the viewer's monitor, its inclusion in the field guide functioning as an in-joke about the writing craft, the plant sustainable for months by "a hasty novella" (p. 57). And the Wild Homilywort, a playful contribution by Alex Chambers, is essentially the sage professor of the plant world, lecturing publicly at the changes of seasons and "interacting not only physically but intellectually with the flora and fauna around it" (p. 20). Christopher Cevasco's Time Cactus is a "long-lived, possibly immortal" plant that originates coincidentally with the formation of a wormhole, "a thin tube of space-time capable of bridging distant regions of the universe" (p. 16). The plant possesses the power to simulate the experience of time travel in someone who, in attempting to grasp one of the blossoms alongside the cactus, becomes "impaled on the obscured needles," and particular specimens have become World Heritage Sites offering glimpses into certain specific windows of the past (pp. 16-17). 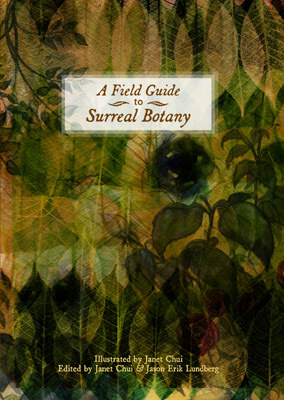 An entire world of possibilities is revealed here in a very small space, representing the best of what a volume like A Field Guide to Surreal Botany is prepared to offer. The book's introduction positions surreal botany as a field of study often met with "disbelief and disdain" and thus having gone "underground," its practitioners contributing erratic reports to newspapers "for lack of other rewards for their work" and thus further distancing the field from serious scientific consideration (p. 1). Naturally, "it became harder and harder to ascertain if some of the printed reports were real or invented," and so "serious gardeners and botanists interested in surreal plants may need to accept such incredulity as part of the nature of this field" (p. 1). I quote heavily from the introduction not simply to acquaint readers with the idea of surreal botany as described by the book's editors, but rather to indicate how the construction of such a field draws a clear relationship between the study of imagined plants and the very real practice of writing (and reading) speculative fiction. The contributors, whose "bravery and dedication to surreal botany are to be applauded" (p. 2), are held up against more traditional botanists as risk takers, rebels, individuals who aren't afraid of venturing into uncharted territories, and thus A Field Guide to Surreal Botany functions as a defense of fantasy itself, in direct contrast with a literary mainstream which has historically been fixated on notions of "realism" (however fraught that concept has become) as the primary mode of storytelling. A Field Guide to Surreal Botany directly addresses the necessity of truth, or reality, in the narratives we produce to explain the world around us. The plant specimens are arranged in the volume by their continent of origin, and the majority of places described can actually be visited by a contemporary traveler, so the book's premise—a glimpse at surreal plants—remains plausible, the writers keeping (mostly) straight faces as they attempt to impart information about their "discoveries." The charming inclusion of a blank Field Notes page invites further collaboration between the reader and the writers who have provided this delightful glimpse into a collective imagination. The investigation of an alternate reality firmly rooted within the confines of our increasingly familiar world is a worthwhile endeavor representative of the general project of fantasy fiction, and here in this little volume of made-up plants is a successful realization of that goal, one which explains the desire to imagine the impossible as a pursuit less about whimsy or fancy and more about discovering the hidden possibilities of the world we think we already know. Who are we, the book asks, to say that these plants do not exist? What do we really know, anyway? Richard Larson is a graduate student at New York University. His short stories have appeared (or are forthcoming) in ChiZine , Pindeldyboz , Electric Velocipede , Strange Horizons , and others. He blogs at rlarson.typepad.com.